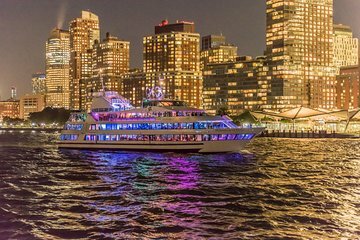 Ring in the holidays right thanks to this 3-hour Christmas Eve buffet dinner cruise in New York. Toast Santa with an included glass of sparkling wine, cruising along the Hudson River, East River, and New York Harbor as you enjoy views of landmarks like the Brooklyn Bridge and Statue of Liberty. An onboard DJ helps ensure a memorable night out. Depart from New York’s Pier 40 in the early evening. You’ll kick off your cruise aboard this luxury yacht with an included glass of sparkling wine and a warm greeting from the staff, who will show you to your seat. About 30 minutes after boarding, your ship sets sail for a magical cruise along the waters near Manhattan. The buffet will open, and you can begin to dig into a tasty holiday-themed feast as you enjoy views of the Hudson River, New York Harbor and the East River. As the boat continues on this magical Christmas Eve celebration, you’ll enjoy views of the Empire State Building, the Statue of Liberty, Ellis Island, and the towering presence of the new One World Trade Center (formerly the Freedom Tower). Soon you’ll sail up past Governor’s Island and into the East River, passing under the Brooklyn Bridge and Manhattan Bridge as you go. Make the return trip back the same way you came, enjoying the views accompanied by dessert, drinks, and music provided by the on-board DJ. You’ll end the evening with plenty of time left to greet Santa, returning to shore around 9pm.